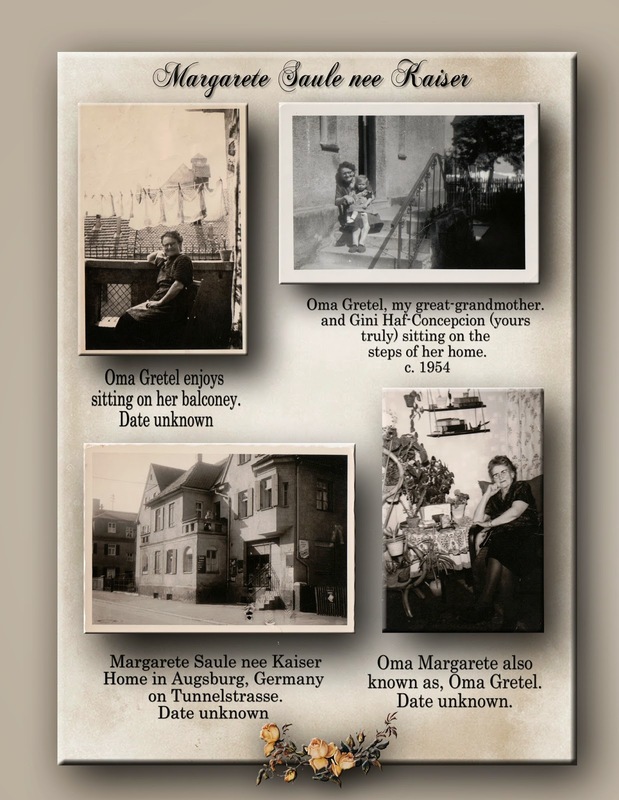 As I created this page for the book I am putting together on my maternal Haf~Kaiser, line, I recalled the few wonderful memories of my great-grandmother, Margarete, aka Gretel. She was a very small framed lady . . . always very warm and loving to me . . . I am so glad that I was able to know her in my lifetime. She had such a sweet smile. I love these photos of her home and how I was there when I was little. When I was three, mom (1933~2010) and I left Germany, I didn't see my great-grandmother again until 1967 at Christmas time and it was a most memorable time indeed . . . memories to create more pages for my book - I hope to share those pages from time to time here on my blog. Love that you got to know your great grandmother. The page is layed out nicely and the photos actually look 3D on it. Good job Gini. Thank you, Diane . . . I am enjoying working on this book, a bit of a challenge learning Blurb and the photo editing program but it will be so worth it when it's completed. I would not have been able to do it without the help of my genealogy friend, Terri! So glad you stopped by and it was great seeing you yesterday. Really like this page Sis - your doing great - keep going!! Thank you sis, I could not have done it without you. I am excited to keep going . . . you are my biggest fan. Beautiful page Gini! Great job! Your book will be wonderful! Thank you Cheryl . . . learning PSE and Blurb has been a real challenge! It's friends like you that keep me going and inspire me. Can't wait to finish it and show you. I love the looks of this page -- the photos seem to be hovering. I downloaded Blurb BookWright but I'm not sure that's what I need - I am not making much headway. Are you using a Blurb template? What a beautiful page you made and you do such professional work. I wish you would post creative lessons for the rest of us to use in our books. You do beautiful work, I love it! Thank you, Wendy, Betty and Anna . . . I have a ways to go with my book but I love spending the time with my ancestors. Wendy, yes, I am using Blurb . . . I created the page in Photo Shop Elements and then uploaded the page to Blurb (Book Smart). I don't know if it's just me but I struggle with Blurb's templates a bit. Slowly learning both programs!